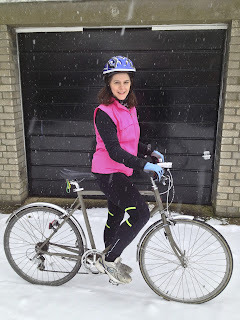 I got to the point that I would cycle every day no matter what the weather -rain, snow, ice…. bring it on. I loved it. Loved the challenge, loved the adrenalin, loved the change in my body - id never been so fit, never felt so energetic. It was fabulous…… and then I moved to Qatar. Doha is a relatively small, flat city, compared to London of course, and the roads are good and well maintained, although there are endless roadworks everywhere as they try to upgrade, remodel, widen and re-route to keep up with the pace of progress and construction of all things world cup related. The weather is great pretty much all the time - little rain and certainly no snow or ice. With the exception of summer heat, occasional strong winds and the odd sandstorm, its perfect cycling weather for at least 9 months of the year. 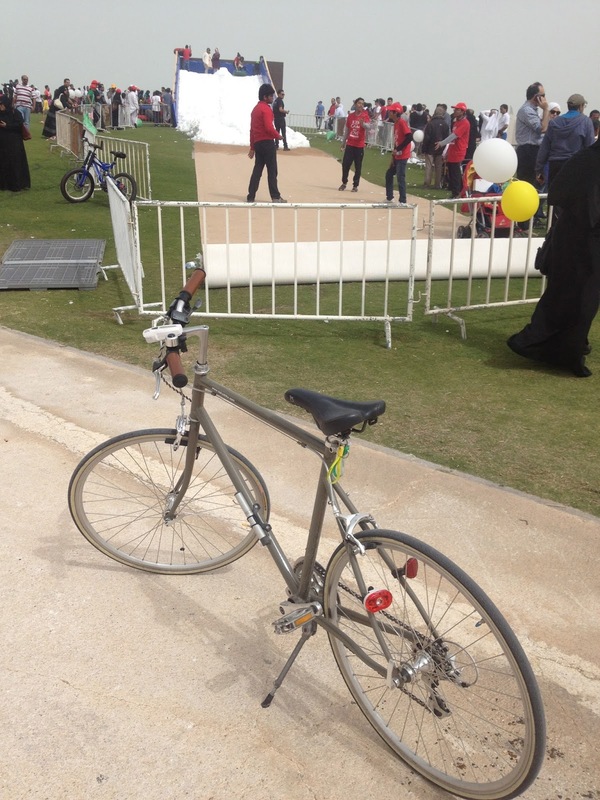 So, one might think its the perfect cycling city….. until you venture onto the roads for real and experience the driving. Only after a couple of days travelling in a cab to work, I decided - theres no way Im cycling here. Crazy, nutty fruitcake speed freaks who pay scant attention to rules of the road, even less to other drivers, even less to pedestrians and then….. 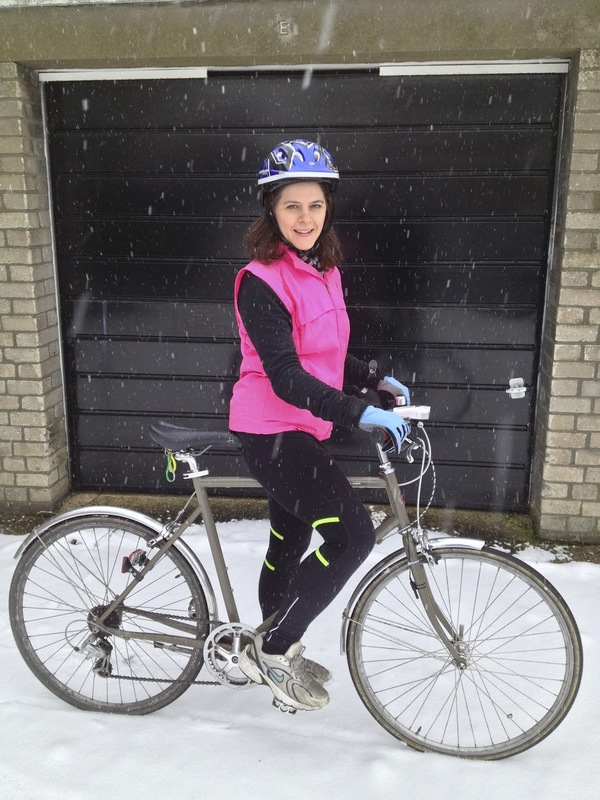 cyclists?!….. what are they??? For the first few weeks I didn't see one cyclist and then occasionally I'd see one - usually of South Asian origin, no helmet, no hi-vi, no lights, and seemingly no fear! !…… but actually more likely simply no car. Public transport here is almost non existent - no metro (they're building it) and a only a few buses but the car is king - well, the Toyota Landcruiser is king. Mobile phone use while driving is a national pastime and driving decisions are made at the latest possible moment…… one doesn't plan ahead… if one wants to turn left cutting across other lanes of traffic, one will simply close ones eyes and do it. Wearing seat belts is the law here but again, not universally seen as necessary…. I've been driven by several locals who don't use their seatbelt. When I protested, the response varied from… "its uncomfortable and doesn't look cool" to "If I have an accident, God will save me, not the seatbelt." So lets just say its not a mature driving nation and throwing myself into this mix on two skinny wheels, with only a layer of lycra and a honeycomb of polystyrene strapped to my skull for protection, seemed beyond bonkers and I'd never do it because I valued my life way too much. So here I am now, officially bonkers, after having spent the last 6 months cycling to work a few times a week. I brought my lovely Grey Legs back with me from the UK on my flight after the Christmas holidays. And I have to say Im totally loving it, but they key has been to find a route to work which doesn't involve too much on-road riding! And what a lovely route it is. 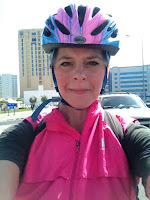 My hotel is on the Corniche in Doha which is a promenade which encircles the waters of the Persian Gulf, from the Museum of Islamic Art at one end to the Sheraton Hotel at the other - approximately 5km end to end. 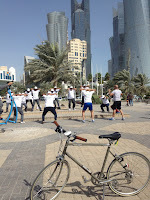 My morning cycle takes me just over half way around the bay, past the fishermen who are there from before sunrise, the palm trees bending in the regular shamaal wind, Dhows waiting to take random visitors on a 10 minute spin round the bay and the ever present labourers who toil in the hottest of temperatures to keep Doha looking good - especially this particular stretch which is right opposite the Royal Palace. Some days Im busy in thought as I cycle (not having to focus on duelling with taxis and buses as I did in London) and some days, I take in the view and have to pinch myself when I realise this is now my commute to work!! Its definitely a change to the Stroud Green Road!! And then…. I have to cross an enormous junction of two six lane highways, where my attention must resume to the road and my focus must be 110% if I want to survive and reach the other side intact!! The golden rule with these junctions is not to take the sort of calculated risks I did in London, trying to beat the lights, skip across red ones when it was safe etc. Here, even crossing when the green man is lit, isn't a guarantee of safety, as drivers regularly jump red lights here. No, this requires absolute concentration and complete caution!! Once safely across, I resume my journey up Khalifa Street on the pathway beneath the trees to Al Jazeera. I have to be a little careful here because Im cycling on block paving, which hasn't been perfectly laid and little bricks pop up unannounced at random intervals just to keep me and Grey Legs on our toes/tyres!! Get it wrong and it could be a puncture or worse. 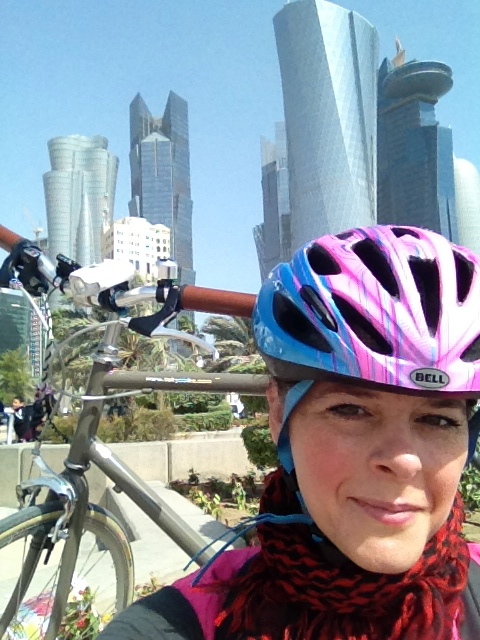 When I said Doha was flat, its all relative. Khalifa street is uphill in the mornings and when there is a headwind (and its always a headwind), it can be a bit of a struggle, especially in 38 degrees and 60% humidity, which it was last week!!! We pass the beautiful and grand Abdul Wahhab Mosque (the Qatar State Mosque) every day. It covers an impressive 175,000 sq metres and has 28 domes over the central hall and 65 domes over the outer quadrangle. It can accommodate 11,000 men in the central hall and 1200 women in the adjacent female prayer room. But the total congregation space can potentially take 30,000 people! 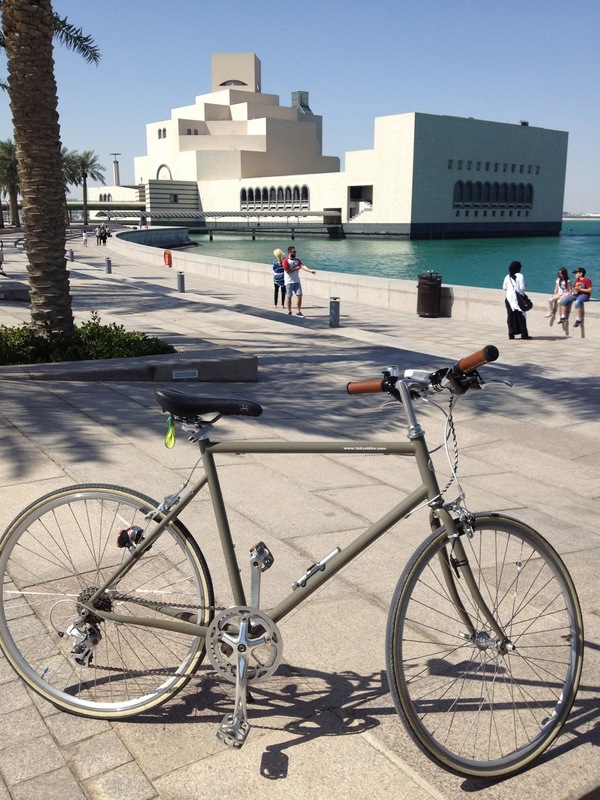 It was officially opened in December 2011 by the then Emir, Sheikh Hamad bin Khalifa al-Thani. And during the winter, when the nights draw in, I still get a thrill seeing the Doha cityscape lit up in different colours every night!! 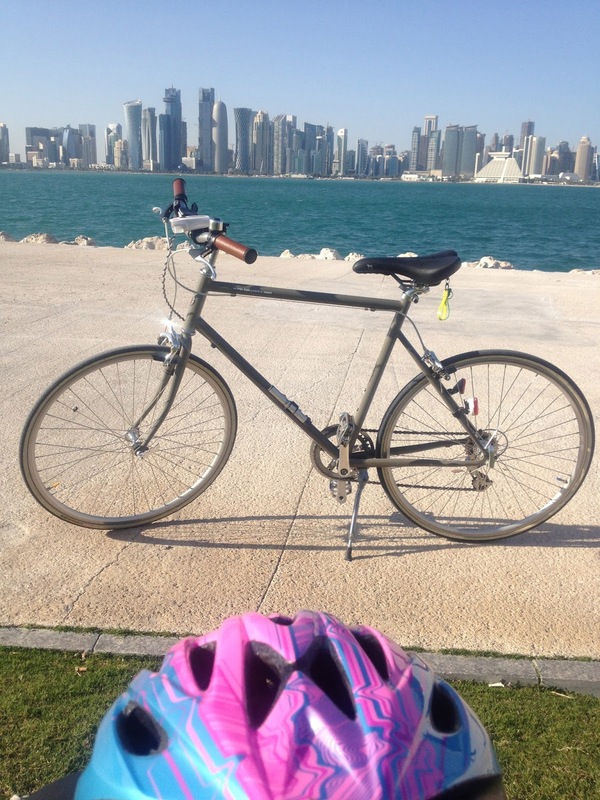 I often stop and sit, and take a moment to reflect and keep my eyes peeled for the Corniche police - lets just say its not officially sanctioned bicycle territory!! But Grey Legs and I don't just commute together - we've taken a few leisure trips too - such as Qatar Sports Day. The one day each year where Qatar gets healthy - to the point where even shisha is banned for the day!! It is a national bank holiday and the nation is encouraged to engage in a sporting endeavour of some kind. 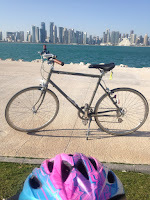 All along the Corniche and at other venues across Doha, people are running, cycling, stretching, bending, playing football, netball, handball, and even -would you believe in 30 degrees - even skiing. Here we are queuing to ski down the smallest ski slope Ive ever seen - mind you by the time we got there, most of it had probably melted!! 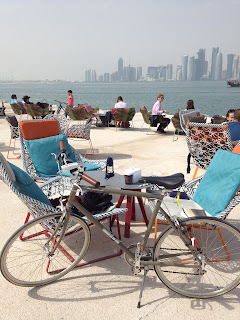 And we go for coffee together in the Islamic Museum park, a favourite place to relax, read, unwind from the week's craziness and take in the city skyline and the boys on jet-skis who enjoy racing past and soaking unsuspecting onlookers with their spray! 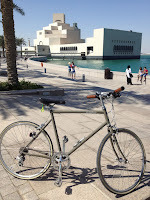 And its one of the few places where bicycles are encouraged and in fact, they even have bicycle rentals here too. But Grey Legs' proudest moment came when we spent the day with the Tour of Qatar on its final leg along the Corniche. It was incredibly thrilling to be at such close proximity to the energy and speed of the world's cycling greats. And after the race had finished, we cycled around the course and even got applauded by a family who were picnicking beside the road. Not sure if they were just excited to think there was another event, simply getting into the spirit of it all, or genuinely thought I was a poor straggler who they were willing along to the end!! Either way, it was fabulous, just having our wheels on the same tarmac as the great Wiggo!!! who didn't place anywhere in the end! As Ramadan now approaches and the temperatures are soaring into the 40s daily and the humidity increasing into the 70%s and more, the time has come to give Grey legs a well earned rest from the commuting for a few weeks, but we'll be back, Inshallah. Thank you for your blog entry on bike commuting in Doha! Very encouraging. 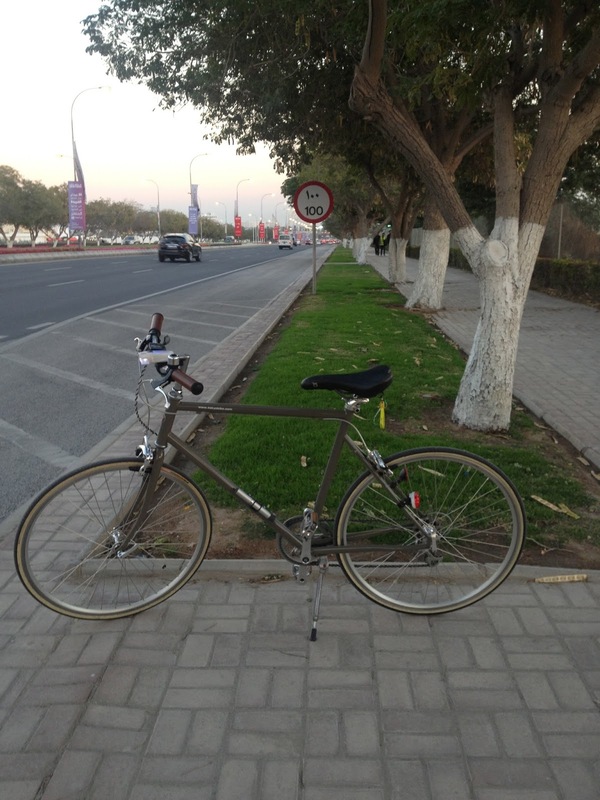 I'm a newly moved here expat, been here a week and brought my folding bike thinking I could bike to work. Am happy to know you've had success touring the city. Hope we can connect and ride together sometime soon! Thanks Yuma! Im cycling longer rides on Fridays now too. ;-) The roads are lovely and quiet at that time.